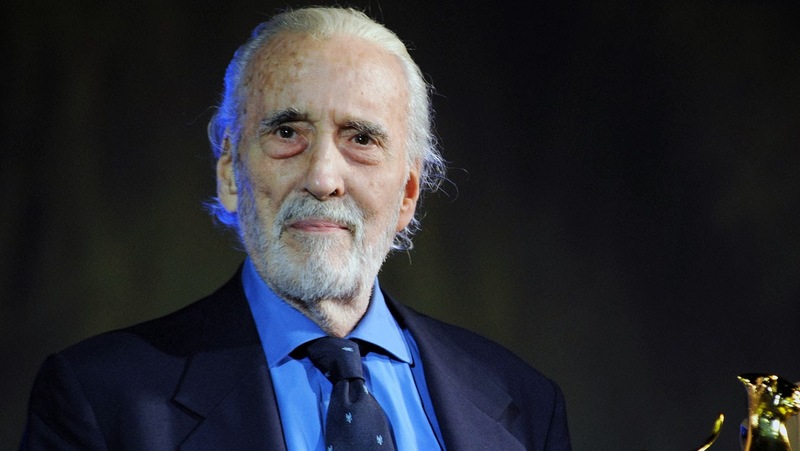 In honour of Sir Christopher Lee being awarded his BFI Fellowship this morning, we've prepared a little piece celebrating the great man's career within the horror genre. Lee is arguably the face of British horror. Originally starting in bit parts, Lee made his horror debut in Hammer's The Curse of Frankenstein and would eventually go on to put his distinctive stamp on Hammer's very own Mummy picture, as well as dominating the screen in his most iconic role as Count Dracula. Roles in countless other British horror features followed, as well as more mainstream appearances in American and European features outwith the horror genre. The actor worked consistently throughout the eighties and nineties in a variety of pictures, yet saw his career gain a new lease of life when appearing in both George Lucas's Star Wars prequels and Peter Jackson's Lord of the Rings saga. His most recent appearances have been little more than cameos (the man is 91 after all) yet Lee can still bring a distinctive charm and unnerve in the smallest of roles. The first of Lee's five cinematic appearances as fiendish crimelord Dr. Fu Manchu is perhaps not technically speaking a horror film, yet certainly has some dark elements - serving as a precursor to many an exploitation film. Lee packs the role with a deadly gravitas yet its clear he is having a ball playing the joyously evil Doctor. The series grew increasingly outlandish yet always remained fun throughout its five films. Prince of Darkness is Hammer's third Dracula film (yet second to star Lee and essentially picks up after Lee's debut as the character in The Horror of Dracula). Helmed by Hammer regular Terence Fisher, PoD has stood the test of time - as it is one of the few original attempts to craft a cinematic sequel to Stoker's now over-told original story. It was also my first experience of Christopher Lee's Dracula and continues to hold a special place in my heart. I would arguably call The Devil Rides Out Hammer Studios' finest moment - terrifying, slickly produced, and featuring one of Lee's most vibrant performances. Lee plays aristocrat Richleau - the film's protagonist who gets tangled in a web of dark magic. Queue frenzied cult rituals (complete with Charles Gray in a goat mask), giant spiders, and chilling apparitions. Unfortunately, Hammer never adapted any further of Wheatley's Richleau stories, yet they did produced a troubled adaption of the author's hit novel To the Devil a Daughter which also featured Lee - see below. The House That Dripped Blood served as part of Hammer rival, Amicus Pictures, own distinctive contribution to horror genre - all star British horror anthologies. Like TV's Tales of the Unexpected, these often amusing little anthologies are packed with wit, charm, and some dark chills. The House that Dripped Blood follows widower Lee as he discovers that his daughter has been dabbling with witchcraft. Horror Express is one of the many on-screen collaborations between Lee and best-friend Peter Cushing. The film essentially centres on a formerly frozen monster that begins to wreak havoc on a passenger train and is as fun as it sounds. Chuck in Telly Savalas to the mix, as well as some amusing banter and grizzled gore and you have an instantly loveable horror classic. AD1972 is the most fun of Hammer's Dracula pictures, yet marked the moment when Lee began to get fed up with the character. He would reprise the role once more alongside Peter Cushing's ever present Van Helsing in The Satanic Rites of Dracula. This tongue and cheek vampire epic chock full of seventies sleaze, colours and Stephanie Beacham. The trailer announces that Dracula is coming to 'freak you out' - if that hasn't got you interested maybe this piece of horror camp is not for you. Never before or since has a film captured such a winning combination of horror, comedy, eroticism and thrills in such an iconic manner - it's no wonder that Lee cites The Wicker Man as the favourite of all his work. Lee plays Lord Summerisle, Laird of a pagan island that lures devoutly Christian copper Edward Woodward over to sacrifice to the their Gods. The Wicker Man is a testament to the skill, ambition, and possibilities that British horror is capable of. One of Hammer's final forays into the horror film was To the Devil a Daughter. This saw the studio attempt to keep up with the rest of the horror industry with features like Rosemary's Baby and The Exorcist tackling the occult and dominating the box office - unfortunately, Hammer's own occult horror was not met with such rewards. Personally, I would say that To the Devil a Daughter deserves re-evaluated - it took some huge risks and deviated from the rest of the Hammer cannon - with the only traditionally Hammer element being the casting of Christopher Lee, who plays an excommunicated Priest who decides to dabble in the dark arts. Lee shines in a more villainous role, surrounded by a cast of top-notch thesps like Denholm Elliot and Honor Blackman. Richard Widmark leads the cast - further helping To the Devil a Daughter deviate from traditional Hammer norms. This incredibly trashy horror sequel is redeemed by Lee's deadpan performance as a private investigator hunting down a half-naked werewoman (Sybil Danning) in Transylvania. This is cheap schlocky fun which Lee described as his own personal embarrassment, but if willing to laugh along with it then its worth a watch. Lee teamed up with original The Howling director, Joe Dante for Gremlins II: The New Batch - where he plays a scientist working in a high-tech media skyscraper that gets terrorised by Gremlins. It may not be his finest moment, but its still rather entertaining to see the actor in this light-hearted context.